At 3:00 P.M. the Union forces struck a heavy Confederate skirmish line. General Smith Atkins’ 9th Michigan cavalry drove the skirmishers back into the first of three lines of breastworks erected across the road. The Union cavalry then constructed heavy barricades in front of the Confederate works. At 6:00 P.M. Confederate General W. B. Taliaferro, whose division was holding position, ordered an attack along his line. The Union forces, though hard-pressed, were able to hold their position due to the arrival of reinforcements from the 14th Corps. Nightfall found the two armies in nearly the same positions they had held throughout the afternoon. General W. T. Sherman, Union commander, arrived on the field during the night. At 6:00 A.M. on March 16th, the Union forces attacked Taliaferro’s line, driving the Confederates before them. Then the Southerners launched a desperate counter-attack. A disaster for the Union forces was averted when portions of the 20th Corps arrived upon the field. Three batteries of artillery were placed in the position near the John Smith house. These began firing upon the Confederates, driving them back into their breastworks. At 11:00 A.M. two newly-arrived Union brigades engaged the Confederates in front, while the brigade of Colonel Henry Case assaulted the Confederate right flank. This attack forced the Confederates to withdraw into their second line of works. 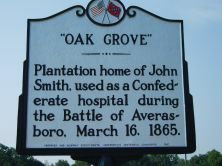 On the morning of March 16th, after the fight of the preceding afternoon around John Smith’s house 2 miles south of this road, Union General H. J. Kilpatrick’s cavalry found a back road circled to the rear of the Confederate position. The Union cavalry attempted to use this road to flank the Confederates, but was stopped by Colonel G. P. Harrison’s brigade of McLaws’ division after moving only a short distance. General W. B. Taliaferro decided to abandon the Confederate second position after finding his men in danger of being flanked. At 1:00 P.M. he withdrew to the third and final line of earthworks, where he was assisted by McLaw’s division on his left and Wheeler’s dismounted cavalry on his right. Rhett’s disorganized brigade was held in general reserve. The Union forces soon advanced and established a strong line immediately in front of the Confederate third line. From this new position they pressed the Confederates all afternoon and part of the evening, but were unable to break the line. At 8:00 P.M. General W. J. Hardee, commanding the Confederate forces at Averasboro, having accomplished his objectives, began withdrawing his corps along the Smithfield road. Wheeler’s cavalry was left behind to cover the retreat. 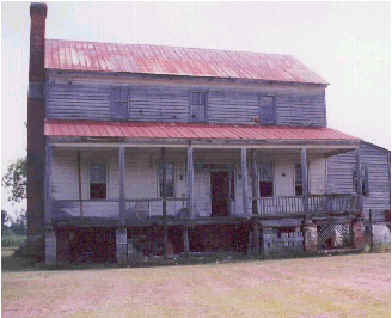 By 4:00 A.M. on March 17th, all Confederate units had been withdrawn leaving the Union forces in control. General Hardee wished to accomplish two things by contesting the Union advance at Averasboro. 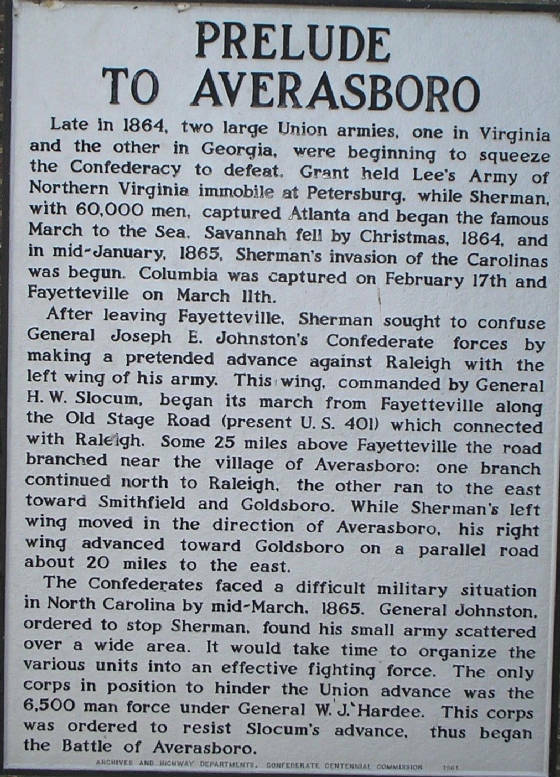 The first objective was to determine for General Joseph E. Johnston, commander of all Confederate forces in the Carolinas, whether Sherman’s army was advancing on Raleigh or Goldsboro. The Confederates learned it was moving on Goldsboro. The second objective was to stretch out the distance between Sherman’s left and right wings (which were moving on parallel roads) in order to give General Johnston a chance to concentrate his smaller army and destroy the Union left wing before the right wing could come to its assistance. Both of these objectives were fully accomplished. The stage was now set for the greater Battle of Bentonville fought 25 miles east on March 19-21, 1865. Mark A. Smith and Wade Sokolosky, both career military officers, lend their professional eye to the critical but often overlooked run-up to the seminal Battle of Bentonville, covering March 11-16, 1865. Beginning with the capture of Fayetteville and the demolition of its Arsenal, Smith and Sokolosky chronicle the Battle of Averasboro in greater detail than ever tackled before in this, the third volume of Ironclad's "The Discovering Civil War America Series." In the two-day fight at Averasboro, Lt. Gen. William J. Hardee's Corps conducted a brilliantly planned and well-executed defense in depth that held Sherman's juggernaut in check for two full days. Having accomplished his objective, Hardee then broke off and disengaged. This delay permitted General Joseph E. Johnston to concentrate his forces in preparation for what became the Battle of Bentonville. The book includes new maps, abundant illustrations, and a detailed driving and walking tour for dedicated battlefield stompers. Mr. Bradley has written an outstanding account of the soldiers who fought this landmark battle in the waning days of the war, and he has given us a thorough look at what was going on in the minds of the Generals who led their soldiers to the killing fields of Bentonville. Bradley has also included an outstanding photo collection of the battlefield as it appears today, something that is rarely added to most of the narratives on Civil War battles. These photos give us an understanding of the terrain that each man, Union or Confederate, faced on those days in March 1865. I heartily recommend this narrative to all students of the Civil War. The Battle of Bentonville has been neglected too long. Thankfully, Mr. Bradley has corrected that mistake, and he has provided us buffs with a truly compelling story. Special appreciation is due to Mark A. Moore. Mr. Moore's maps of the campaign are outstanding, and they help the reader understand and comprehend the many troop movements of this last major battle of the Civil War in the Eastern Theater. Sources: Mark L. Bradley, Last Stand in the Carolinas: The Battle of Bentonville (1996); Mark A. Moore, Moore’s Historical Guide to the Battle of Bentonville (1997); John G. Barrett, Sherman’s March Through the Carolinas (1956); Wilson Angley, Jerry L. Cross, and Michael Hill, Sherman’s March through North Carolina: A Chronology (1995).